Description: Rigid adherence to scientism―as opposed to a healthy respect for science―is all too prevalent in our world today. Rather than leading to a deeper understanding of our universe, this worldview actually undermines real science and marginalizes morality and religion. In this book, I exposes the self-defeating nature of scientism and help people recognize its harmful presence in different aspects of culture, emboldening our witness to biblical Christianity and arming us with strategies for the integration of faith and science―the only feasible path to genuine knowledge. It demonstrates how 'scientism' and 'secularism' are ideologies that grip people's thinking and practices. It advances a worldview integration paradigm for seeing the relationship between science, philosophy, and theology. It is written in an accessible manner, useful for upper-level high school students, college students, parents, pastors, and parachurch leaders concerned about how to address scientism and secularism's powers. It shows how the Christian tradition is a knowledge tradition and not merely a tradition of religious beliefs and practices. How Do We Explain Things? 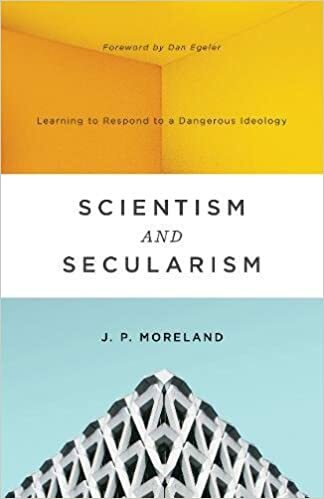 J. P. Moreland’s Scientism and Secularism should be mandatory reading for serious Christians who want to intelligently engage in the interface of philosophy and science. Moreland elegantly guides the reader through concepts typically reserved for serious analytic philosophers and academics. In doing so, he provides a desperately needed and highly accessible treatment of elite-level arguments that both seasoned philosophy veterans and enthusiastic amateurs will enjoy. Moreland thus demonstrates a rare ability to distill complicated and abstract philosophical concepts into a framework for everybody to understand. While scientists who are not philosophically inclined always tend to deride approaches that are not strictly empirical as superfluous, in recent years this tendency has accelerated. Major figures in both academic and popular science characterize philosophy as an anachronism to be abandoned, with only experimental or observable data worthy of discussion. Moreland argues expertly that not only are such claims internally inconsistent, this central dogma of scientism erodes the serious pursuit of knowledge. Scientism isn’t just poor science, it’s poor thinking. Moreland has crafted an eminently readable text that clearly demonstrates that this kind of crude scientistic thinking should be eschewed by all thinkers not dogmatically committed to worshiping at the altar of reductive physicalism. Scientism and Secularism is a book that should be read by any serious Christian who is motivated to integrate science, philosophy, and faith cogently and cohesively. J. P. Moreland is one of the great Christian philosophers of our time. He has shown persuasively that we can know God just as well as we can know anything else. If, as philosophers tell as, knowledge constitutes ‘justified true belief,’ Moreland has shown that we can have such beliefs about God—and, thus, objective, as well as subjective, knowledge of him. In this trenchant critique, he shows not only how the ideology of scientism undermines the justifiable confidence that people should have in their knowledge of God, but that scientism ultimately defeats itself. Scientism claims that hard sciences such as physics, chemistry, and biology provide the only genuine knowledge of reality. Yet, as Moreland shows, scientism does not satisfy its own requirement, because it is not itself based upon scientific evidence or scientific method. Instead, Moreland shows with many concrete examples that many people in our culture simply assume that the hard sciences provide the only foundation for knowledge, leaving them with an impoverished and materialistic view of reality that denies them the joy, hope, and meaning that comes from the knowledge of God. For this reason, Scientism and Secularism is a philosophical treatise with a practical message for anyone wanting to live life more abundantly in accord with genuine knowledge of God. Highly recommended. If you’ve ever been tempted to dismiss a moral, philosophical, or theological belief because you were convinced only science gives real knowledge—or if it’s been done to you—then you’ve been taken in by scientism. This popular notion has crippled the confidence of multitudes of Christians, yet in Scientism and Secularism, philosopher J. P. Moreland handily exposes it for the fraud it is. Moreland cuts through the confusion with his characteristic clarity, insight, and surgical precision, deftly refuting the notion that only science can give knowledge while all else is mere opinion, feeling, or faith. Here is Moreland doing what he does best—dispatching foolishness with careful thought and rigorous assessment. For those taken in by the silliness of scientism, this book will be an eye-opener. Moreland’s effort also serves as a tutorial in the disappearing art of clear thinking for those floundering in the murky waters of secularism.